The Olympics seemed to pass by amazingly quickly and this evening the closing ceremonies are on TV. I joined a knitalong on Ravelry a few weeks ago and the project I chose was block D4 of Kaffe Fassett's Jubilee Throw. For a while I didn't think I was going to complete it in time. There aren't a lot of hours to work on knitting in the evening. However, yesterday I was finished and I'd washed and blocked the piece. Today I took the pins out and it's completely done. I can't say that I'm totally pleased with the results. I stood back and looked at it and the first thing that came into my mind is, "I could have done better". I've done a lot of intarsia and to my mind it's not my best intarsia project. I think I was in too much of a hurry plus I was knocked out with a head cold for days. Those are my excuses. For now, I'll put it with the yarn for the rest of the blocks and will decide if I want to include it in the afghan or make a new one. I won't make that decision for a year or two as that how long it'll take to do all the other blocks. Note: It's now a day later, Monday, and the block is dry and looks good to me. I won't be reknitting the block afterall. What a difference a day makes! No, not those Olympics. 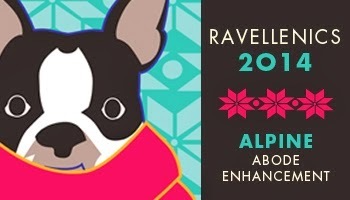 I'm talking about the Ravellenics on Ravelry. My challenge was to knit a square for my Jubilee Throw between the dates of the opening and closing ceremonies. As of today I'm at the halfway point and I'm having some doubts as to whether I can finish in time or not. Below, square D4 is pinned out for the picture but not yet blocked. The size at this point is 21" x 6". I've been doing quite a bit of intarsia (3 projects simultaneously) lately and I'm enjoying it but I have a feeling that there is a one-color sweater in my not too distant future. If I were to do this block again (which I won't) I would make changes in color. I used the original colors as in the afghan pattern - Rowan Felted Tweed DK in #151 Bilberry (background), #150 Rage (the squares) and #179 Horizon. The Jubilee Throw is from a collection of designs from Kaffe Fassett and this one comes from the Box Star Jacket in Rowan #1. I wish I'd knit the blocks in different colors as they are on the sweater instead of making all of them in red. I'll keep that in mind for future afghan squares. I'll look at the original and see if I would like to make any changes before I start knitting. The other change I'm making is to switch to knitting with straight needles. I've always knit intarsia projects on straight needles in the past but for some unknown reason I picked up circulars this time around. I find that it's easier to keep the yarns less tangled with straights. Updated: I've done a few more rows since writing this and used straight needles. I'm back in my comfort zone and working a wee bit quicker. No more circs for intarsia for this girl. This is the first of the 22 blocks that I'll be making. It's time to start thinking about which one I'd like to do next. The first order of business is to announce the winner of last Sunday's little contest. The winner is "Anonymous". If you send me an email I'll get the yarn off to you. Thank you for entering. 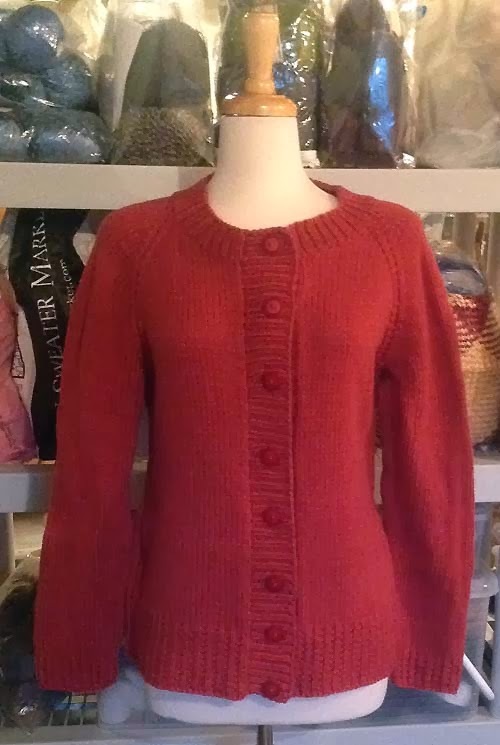 The Ramona cardigan is actually the first finished project of 2014. It was a very quick knit. From start to finish it took less than 3 weeks, even less when you consider that I didn't work on it every day. The pattern is excellent, clear and well-written. Finding buttons that I liked added to the time to complete the sweater. I finally took a picture of it today so I can now call it well and truly finished. Notes: I made a bone head error on the sweater. I forgot to make the buttonhole for the button, second from the top. Thankfully knitting is forgiving and I was able to stretch the stitches and manually make the hole. In the photo the sleeves may look like they are wider towards the cuff. They're not. They are just lying flat after washing and laying out to dry. I have 1 full skein of yarn left over from the project. I bought an extra one for swatching and because I lengthened the body of the sweater by 2". As it turned out I didn't need it. If you'd like the skein, leave a comment and I'll pick a winner at random. The skein is 170 yards/155 meters, probably enough to do a hat or something similar. I'll announce the winner next Sunday, February 23rd. 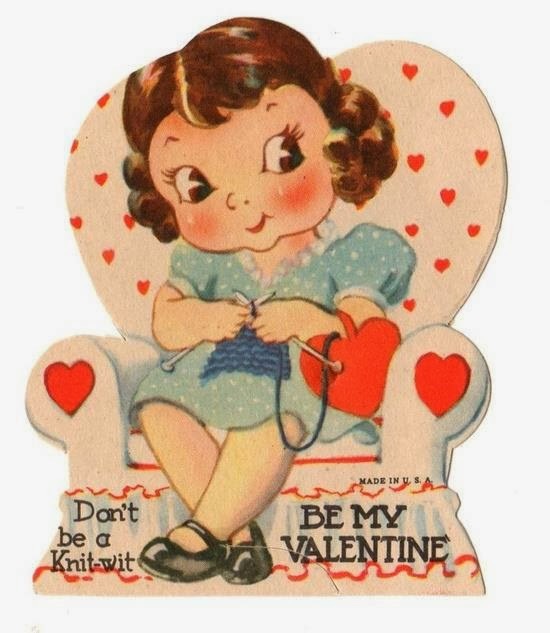 Are you knitting anything for Valentine's Day today? There is a group in Edmonton who have been knitting and crocheting hearts and leaving them in public places in order to bring a smile to the person who finds it. They call themselves Knitmonton and they've done quite a bit of yarn bombing and other fun projects, including making poppies for Remembrance Day. To visit their Facebook page which has many more pictures, click here. I like the way this group thinks, their goal being to make people happy and put a smile on their faces. It's time to put down the knitting needles for a bit and blog about finished projects. There have been two so far this year, this is the second one. I still need to take a picture of the first one. I blogged earlier about a scarf I was going to try to complete in a week, hoping to have it done in time for the Super Bowl. For a while it looked like I wasn't going to succeed as I wasn't happy with the yarn. 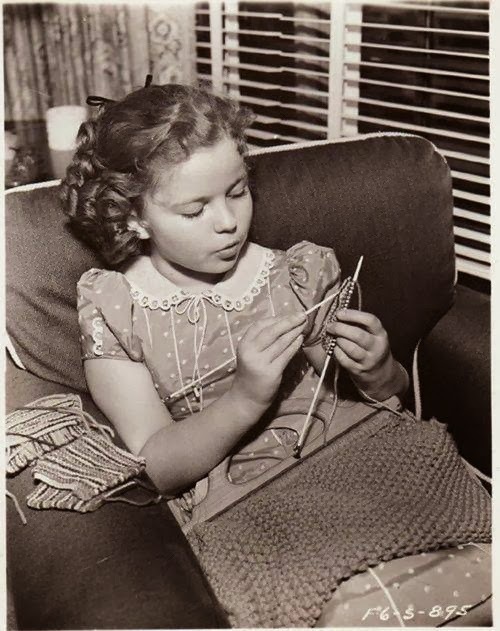 I'd knit, rip it out, start again, and repeat. For the first few tries I didn't like the fabric I was getting by knitting stocking stitch in a tube. It was too flimsy even after going down several needle sizes. 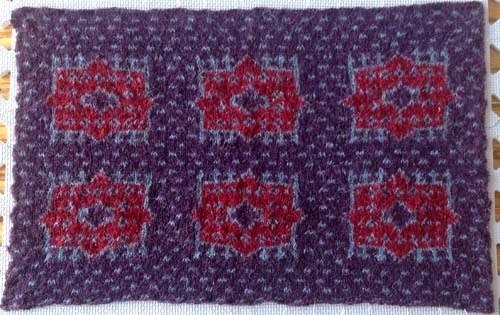 After looking at scarves on Ravelry I came across one that turned out to be an excellent pattern, as you'd expect from Jared Flood's stable of designers, Hayes by Julie Hoover (Ravelry link). 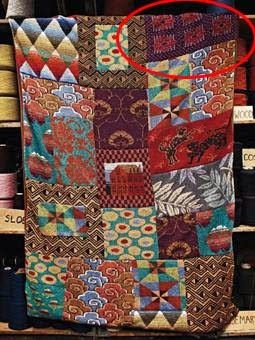 It's shown as a man's pattern but there is no reason why it can't also be for a female. I finally got started on Wednesday night and finished the scarf by half time of the game on Sunday. [Don't ask me about the score!!]. Pattern: Basically used the pattern, Hayes, by Julie Hoover with some changes: I cast on 35 stitches, more than what was called for in the pattern, as I was using a thinner yarn and I changed the striping pattern using one that was made with the Random Stripe Generator. The orange is a rich color but a little less intense as in the picture. Note: I'm not fond of this yarn as it was quite loose even when swatching with a needle several sizes smaller. I decided to stay with #5 needles as I didn't want a tight texture for a scarf. It is nice and soft, however. As I was knitting it occurred to me that these are the same colors as worn by the Edmonton Oilers hockey team. That will never do for a Colorado Avalanche fan like me. 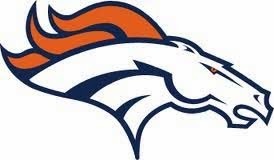 I've ordered two small Broncos patches and will sew one on each end of the scarf to cement the fact that this is a Broncos scarf, not an Oilers scarf. GO AVs!! If you've read all the way to the end....here's a little contest. I had two full balls of yarn left over from this project, one orange and one blue. If you'd like to be entered to win them leave a comment, any comment. I'll announce the winner next Sunday, February 16th. Good luck. I succeeded in my race against the clock and finished the Broncos scarf before the end of the Super Bowl, which is more than I can say about the team. I wish I could say that they succeeded as well. I had hoped that, win or lose, it would at least be a close game but the Seahawks ran away with it, and deservedly so. When I say that I finished, I mean that I finished the number of rows that I'd planned, over 400. However, when I got to the end I decided that the scarf wasn't long enough so I ripped out the bind off row and will keep knitting. The stitches are all knit stitches so the row gauge was like garter stitch, needing more rows to get to the desired length. I'll post a picture shortly, once it's longer and blocked. 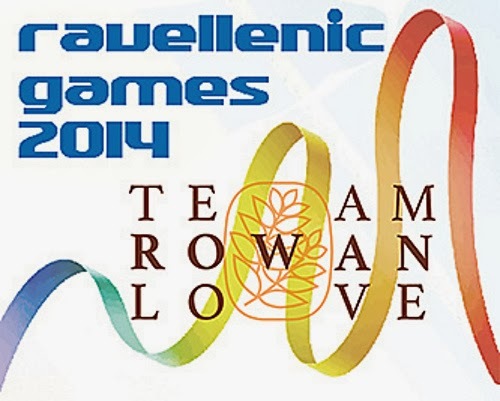 As if that rush to a deadline wasn't enough, I've joined the Ravellenic Winter Games on Ravelry as a member of Team Rowan Love 2014, part of the Rowan Love Ravelry group. If you're a fan of Rowan yarns, patterns, etc., why not join us? Dayana has made us this very nice badge for the event. There are a lot of categories for participation. I've decided to do a colorwork project for the home, which would be an intarsia block for my Jubilee Throw - #D4. It's okay to do part of a larger project if that's your choice. There's no way I could possibly knit the entire afghan. The idea is to cast on during the opening ceremonies of the Sochi games and be finished by the end of the games. It's important that you challenge yourself. I've already knit a couple of rows which I'm counting as swatching, which is allowed, just to see if I like the resulting fabric of the block. I would have ripped it out if it was too tight or loose but I'm satisfied so I won't do anything more until February 7th. Except for weekends I can only knit in the evenings (can you say "day job"?!!) and I'm also working on other projects, like the aforementioned Broncos scarf, so this will be a challenge.